YHF distributed various items including activity books, which explained the health benefits of a variety of different foods. 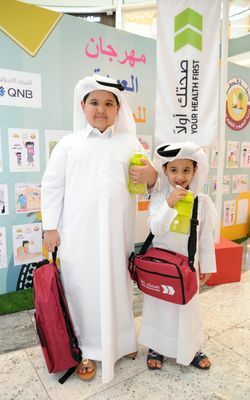 WCM-Q’s Your Health First campaign worked with the Ministry for Education and Higher Education for the second year running to ensure children returned to school with an understanding about the importance of health. As part of the Ministry’s Back to School program, Your Health First distributed school bags, lunchboxes, water bottles, and activity books to children preparing for their first day back at school after the long summer holiday vacation. The activity books explained the health benefits of a variety of different foods, helping parents and children plan meals to ensure they are nutritionally beneficial, while the water bottles remind children to stay sufficiently hydrated. All of the gifts distributed had the Sahtak Awalan – Your Health First branding, which has become synonymous with high-impact health initiatives like Khayr Qatarna, the Color Run, Project Greenhouse and Yalla Natural. 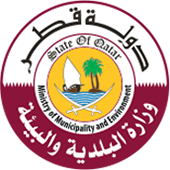 The campaign is run by Weill Cornell Medicine – Qatar with support from its strategic partners; Qatar Foundation, the Ministry of Public Health, the Ministry of Education and Higher Education, the Ministry of Environment and Municipality, Occidental Petroleum, ExxonMobil, and the Supreme Committee for Delivery and Legacy. Education allows children to make the right choices about their health. Mansour Hazae Al Shahwani was one of the parents at the Mall of Qatar. Iman Saleh, a board member for Qatar Cultural Center for the Deaf, was also there. Sahtak Awalan was launched in 2012, and aims to change unhealthy habits into healthy behaviors, and educate a generation about the importance of diet and exercise, creating a healthy nation in line with Qatar National Vision 2030. Nesreen Al-Refai, Chief Communications Officer at WCM-Q, said: “The Ministry of Education has been an invaluable strategic partner of Sahtak Awalan – Your Health First and we are pleased to be able to support their Back to School campaign.